Elected Trustees from Anthony ISD, Canutillo ISD, Clint ISD, El Paso ISD, Dell City ISD, Fabens ISD, Ft Hancock ISD, San Elizario ISD, Sierra Blanca ISD, Socorro ISD, Ysleta ISD, and Tornillo ISD are encouraged to send their student nominations for the "Difference-Maker 2019" award. ​Nominate your student by 3 May. Elected Trustees from Anthony ISD, Canutillo ISD, Clint ISD, El Paso ISD, Dell City ISD, Fabens ISD, Ft Hancock ISD, San Elizario ISD, Sierra Blanca ISD, Socorro ISD, Ysleta ISD, Tornillo ISD, ESC Region 19, and El Paso Community College are invited to attend the Trustee Breakfast. ​Friday, 10 May @ 7:30am at Rudy's (I-10/Yarbrough). ​Oh so many charter transparency bills! STAAR Test Audit - Contact your Elected Officials TODAY! 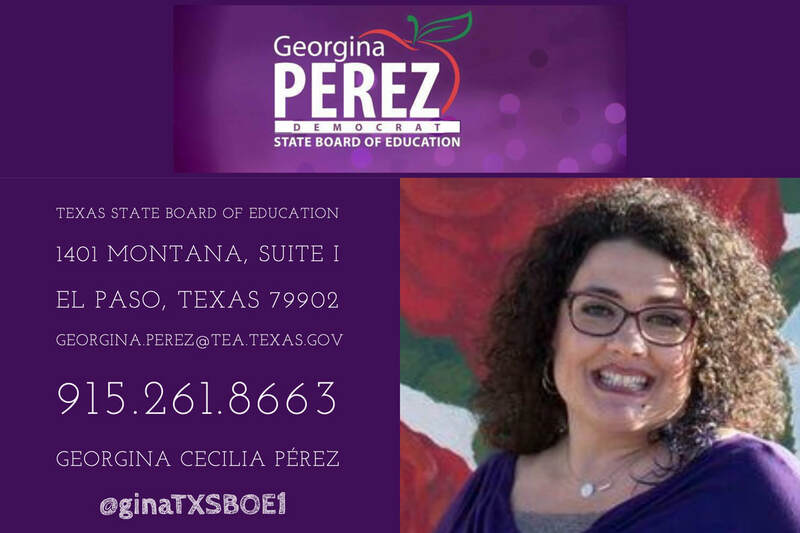 The Texas State Board of Education does not provide a stipend, or funding for an office or staff. Your contribution is necessary for us to continue this important work.